Research: We found that emmetropization is regulated bidirectionally by two different sets of signaling pathways; one underlying response to negative defocus and the other that underlies response to positive defocus. We refer to this mechanism as Bidirectional Emmetropization by the Sign of Optical Defocus (BESOD). We also identified key signaling pathways underlying retinal responses to the defocus of different signs, which provides the framework for the development of anti-myopia drugs. This image shows the effect of negative (green) and positive (red) lenses on eye growth and the heatmap depicting clusters of genes differentially expressed in the retina in response to optical defocus. Response: Environmental factors such as nearwork and reading generate imposed negative defocus on the retina and can cause myopia. The impact of myopia-causing environmental factors on each individual (and whether or not this individual will develop myopia) is determined by the genetic background of that individual and individual genetic variations within the molecular pathways that control the eye’s response to positive and negative defocus. How well we understand molecular signaling pathways underlying eye’s response to defocus will determine our ability to develop effective pharmacological treatment options for myopia. Response: Future research should be focused on gaining deeper understanding of the genes and signaling pathways underlying emmetropization and development of myopia. Clearly, more funding should be directed towards systems genetics and pharmacogenomics approaches because I believe that this is the most promising path to finding a cure for myopia. 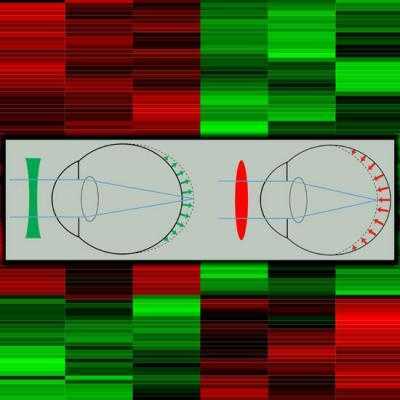 Response: We are entering a new era in myopia research, as systems genetics approaches open new ways to explore molecular signaling underlying development of myopia on a whole-genome scale. This will undoubtedly lead to the development of new effective treatment options for myopia. This work served as a basis for a patent application titled “Process of treating myopia by modulating retinal signaling pathways underlying retinal response to positive and negative optical defocus”. This entry was posted in Author Interviews, Columbia, Environmental Risks, Genetic Research, Ophthalmology, PLoS and tagged ColumbiaMed, myopia, nearsighted, ophthalmology by Marie Benz MD FAAD. Bookmark the permalink.